21.22 Alfred Knudson proposed that retinoblastoma results from two separate genetic defects, both of which are necessary for cancer to develop. 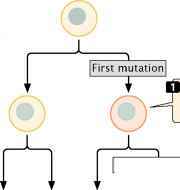 additional mutations are required to produce cancer, and the cancer will tend to run in families. The idea that cancer results from multiple mutations turns out to be correct for most cancers. Knudson's genetic theory for cancer has been confirmed by the identification of genes that, when mutated, cause cancer. Today, we recognize that cancer is fundamentally a genetic disease, although few cancers are actually inherited. Most tumors arise from somatic mutations that accumulate during our life span, either through spontaneous mutation or in response to environmental mutagens. The clonal evolution of tumors Cancer begins when a single cell undergoes a mutation that causes the cell to divide at an abnormally rapid rate. The cell proliferates, giving rise to a clone of cells, each of which carries the same mutation. Because the cells of the clone divide more rapidly than normal, they soon outgrow other cells. Additional mutations that arise in the clone may further enhance the ability of those cells to proliferate, and cells carrying both mutations soon become dominant in the clone. Eventually, they may be overtaken by cells that contain yet more muta tions that enhance proliferation. In this process, called clonal evolution, the tumor cells acquire more mutations that allow them to become increasingly more aggressive in their proliferative properties (I Figure 21.23). The rate of clonal evolution depends on the frequency with which new mutations arise. 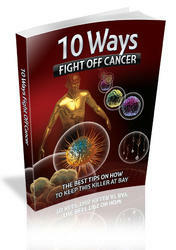 Any genetic defect that allows more mutations to arise will accelerate cancer progression. Genes that regulate DNA repair are often found to have been mutated in the cells of advanced cancers, and inherited disorders of DNA repair are usually characterized by increased incidences of cancer. Because DNA repair mechanisms normally eliminate many of the mutations that arise, without DNA repair, mutations are more likely to persist in all genes, including those that regulate cell division. Xeroderma pigmentosum, for example, is a rare disorder caused by a defect in DNA repair (see p. 000 in Chapter 17). People with this condition have elevated rates of skin cancer when exposed to sunlight (which induces mutation). A cell is predisposed to proliferate at an abnormally high rate. A second mutation causes the cell to divide rapidly.